This week I’m back with a final photo from the chapel dedicated to the Immaculate Conception of Our Lady, in Mosta. After I had finished with the wide angle photos, as the sun dipped below the horizon, I packed my gear. Rather than leave right away, I switched to a telephoto lens and walked about a bit to explore alternative points of view. I could see a storm approaching from the east and the sky started turning even more interesting. Apocalyptic is a word that comes to mind. I learnt a long time ago that it pays to not pack up when the sun disappears. As with most architecture photography, there’s not much real choice when it comes to composition. There’s often very few points of view that lend themselves to good compositions, unless one starts to look only at specific details. Today’s photo shows the second one I found to be any good. In closing, I must stress that the colours in the photo are real, not the result of some digital fakery (which has become all too easy, and therefore common, nowadays). 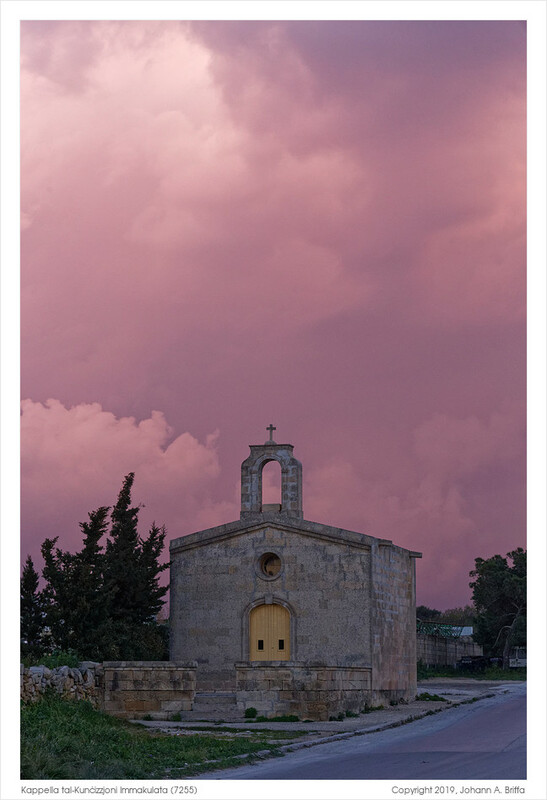 I tip my hat to the photographer.I think Mosta is the pearl of wonderful Malta.It is becoming increasingly rare to be able to gaze at an image and know it is genuine.Bravo!! Thank you! I think most people will think of the big rotunda (the parish church) when they think of Mosta, and forget about the many small chapels, often in beautiful surroundings.